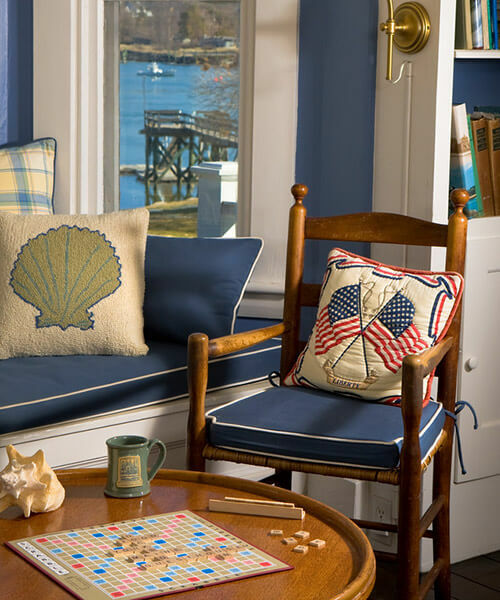 The Best Views of York Harbor :: Experience the "Real Maine"
Located on southern Maine’s rocky shoreline, Dockside Guest Quarters is the best York, Maine oceanfront hotel, offering you unparalleled views of York Harbor. We provide you with a comfortable and unpretentious place to stay in York, Maine. 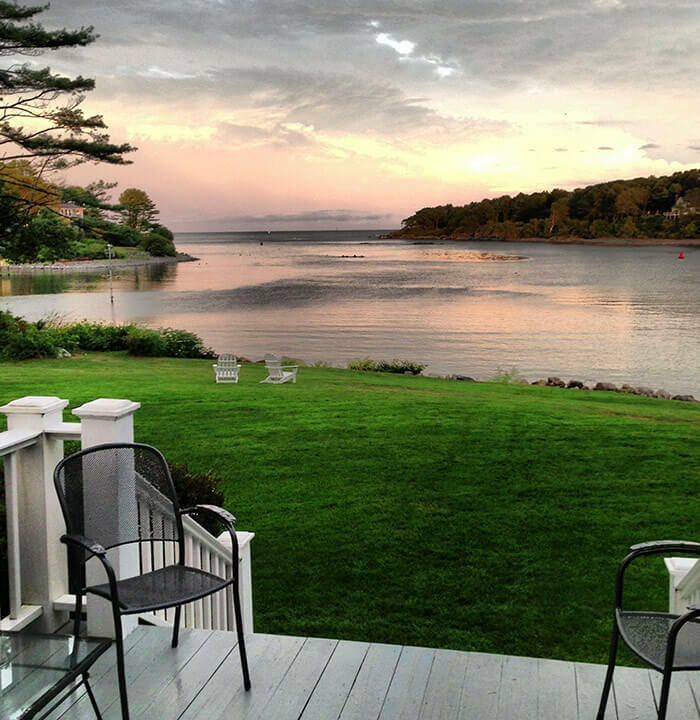 From the moment you discover the view from your guestroom, until the time you bid our helpful staff farewell, you’ll know our beautiful inn was the right choice for your romantic getaway in York, Maine or family vacation to the coast. More than sixty years ago, David and Harriette Lusty founded Dockside Guest Quarters so vacationers could experience “the Real Maine.” Vacations are few and far between and we believe everyone deserves an extraordinary place to celebrate special occasions, rekindle romance, or just relax. Our beautiful bed and breakfast, located in York Harbor, Maine is ideal for short stays and even better for extended Maine vacations. Our property provides one of the best event venues in southern Maine, perfect for weddings or family reunions. Comfortable accommodations, fresh breakfasts and our onsite restaurant and lounge offer guests a wonderful experience at our bed and breakfast near Portsmouth, NH. Plus, we’re so close to the historic attractions, outdoor recreation, and the shopping of York Harbor, Kittery, York Beach, and Kennebunkport. Our magnificent Maine Inn and Restaurant grew out of humble beginnings as a small marina and guest house. In 1953, David Lusty purchased Harris Island — complete with a dilapidated 15-room house, circa 1891 — to build and operate a marina. During the summer of 1954, Harriette Sibley arrived on the scene to assist the growing business, and married David the next year. Visiting yachtsmen would often inquire about accommodations and hot showers while ashore in the large house overlooking the harbor. After several lodging requests, David and Harriette decided to renovate the house and turn it into yachtsmen’s quarters. This was such a hit that people were soon coming by car to stay on Harris Island. Over the next 20 years, while raising four sons, they added a 90-seat restaurant and 4 multi-unit buildings to the property — bringing the room total to 25. The Dockside is now in its second generation of Lusty family management after David and Harriette guided and nurtured their creation for 35 years. The third generation is not far behind, on any given day you will see the second and third generation working in all facets of the family business. Dockside Guest Quarters is now managed by second son Eric Lusty and his wife Carol. They have been at the helm for 30 years. 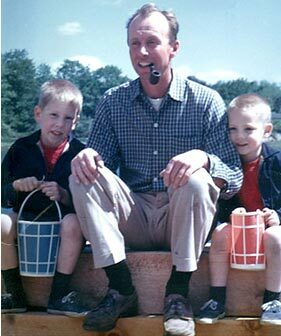 They have three sons; Harrison, Connor, and Ryan. Carol came to Maine from Virginia to teach school after graduating from college. Eric holds a Coast Guard license for navigating large ocean-going ships that he obtained while at Marine Maritime Academy. Before innkeeping, they both worked for Cruise International, a Norfolk, Virginia-based harbor cruise ship operator. The Dockside Restaurant is operated by third son Philip Lusty and his wife, Anne. They have two children; Meghan and Andrew. Philip and Anne have been managing the restaurant for 25 years. Philip earned his B.S. in Food, Hotel & Tourism from the Rochester Institute of Technology. Following graduation, Philip was hired by Hilton Hotels and relocated to Westchester County, N.Y. where he worked his way to Director of Catering. It was during this tenure in N.Y. that he met Anne, who is a graduate of Siena College with a B.S. in marketing and has subsequently earned her M.B.A. from Franklin & Pierce College. Anne too was employed by Hilton Hotels as a Director of Catering in Danbury Ct., a competing hotel! Now they are on the same team and have used their combined experience to develop a wonderful à la carte dining and catering operation. The town of York is located on the southern Maine seacoast. When you stay at the Dockside Guest Quarters all of Coastal Maine’s outdoor recreation, family activities, shopping, attractions and natural beauty will be an integral part of your experience. Many people visiting York, Maine comment that they have traveled twice as far for half as much. From Interstate 95, take exit #7 in York, ME. Proceed on the spur road to US Route 1. Turn right/south on US Route 1. Turn left on Route 1A/York Street at traffic light. Proceed on Route 1A/York Street through York Village to Route 103. Turn Right on Route 103. Turn left on Harris Island Road, immediately after crossing York River. Drive to end of Harris Island Road and then follow signs. If you have any questions please call the Dockside at 207-363-2868.